WASHINGTON The Air Force stripped an unprecedented 17 officers of their authority to control -- and, if necessary, launch -- nuclear missiles after a string of unpublicized failings, including a remarkably dim review of their unit's launch skills. The group's deputy commander said it is suffering "rot" within its ranks. "We are, in fact, in a crisis right now," the commander, Lt. Col. Jay Folds, wrote in an internal email obtained by The Associated Press and confirmed by the Air Force. The tip-off to trouble was a March inspection of the 91st Missile Wing at Minot Air Force Base, N.D., which earned the equivalent of a "D" grade when tested on its mastery of Minuteman III missile launch operations. In other areas, the officers tested much better, but the group's overall fitness was deemed so tenuous that senior officers at Minot decided, after probing further, that an immediate crackdown was called for. The Air Force publicly called the inspection a "success." But in April, it quietly removed 17 officers at Minot from the highly sensitive duty of standing 24-hour watch over the Air Force's most powerful nuclear missiles, the intercontinental ballistic missiles that can strike targets across the globe. Inside each underground launch control capsule, two officers stand "alert" at all times, ready to launch an ICBM upon presidential order. "You will be a bench warmer for at least 60 days," Folds wrote. The 17 cases mark the Air Force's most extensive sidelining ever of launch crew members, according to Lt. Col. Angie Blair, a spokeswoman for Air Force Global Strike Command, which oversees the missile units as well as nuclear-capable bombers. The wing has 150 officers assigned to missile launch control duty. The trouble at Minot is the latest in a series of setbacks for the Air Force's nuclear mission, highlighted by a 2008 Pentagon advisory group report that found a "dramatic and unacceptable decline" in the Air Force's commitment to the mission, which has its origins in a Cold War standoff with the former Soviet Union. In 2008, then-Defense Secretary Robert Gates sacked the top civilian and military leaders of the Air Force after a series of blunders, including a bomber's mistaken flight across the country armed with nuclear-tipped missiles. Since then, the Air Force has taken numerous steps designed to improve its nuclear performance. Although sidelining 17 launch officers at once is unprecedented, the Air Force said stripping officers of their authority to control nuclear missiles happens to "a small number" of officers every year for a variety of reasons. In addition to the 17, possible disciplinary action is pending against one other officer at Minot who investigators found had purposefully broken a missile safety rule in an unspecified act that could have compromised the secret codes that enable the launching of missiles, which stand on high alert in underground silos in the nation's midsection. Officials said there was no compromise of missile safety or security. Folds is deputy commander of the 91st Operations Group, whose three squadrons are responsible for manning the wing's 15 Minuteman III launch control centers. Advising his troops on April 12 that they had "fallen," Folds wrote that drastic corrective action was required because "we didn't wake up" after an underwhelming inspection in March that he said amounted to a failure, even though the unit's overall performance technically was rated "satisfactory." That is two notches below the highest rating. "And now we're discovering such rot in the crew force that your behavior while on alert is accepting of" weapons safety rule violations, possible code compromises and other failings, "all in the name of not inconveniencing yourselves," Folds wrote. Folds also complained about unwarranted questioning of orders from superior officers by launch crews and failure to address superiors with the proper respect. "We are breaking you down, and we will build from the ground up," Folds added. He later wrote, "It takes real leaders to lead through a crisis and we are, in fact, in a crisis right now." He told his subordinates, "You must continue to turn over the rocks and find the rot." When the AP inquired about the Folds email, the Air Force arranged a telephone interview with one of Folds' superiors, Col. Robert Vercher, commander of the 91st Missile Wing. The wing is one of three that operate the nation's fleet of 450 Minuteman III missiles; the two others are at Malmstrom Air Force Base, Mont., and F.E. Warren Air Force Base, Wyo. "We are frustrated anytime we're performing less than we expect of ourselves," Vercher said, adding that he and other senior officers are implementing an aggressive and innovative plan to restore a record of high performance among launch control officers. "There was a problem," Vercher said. "And we will fix it." Vercher said Folds was expressing frustration. "That is a very passionate leader embarrassed by a performance below our expectation," Vercher said, adding that Folds was disappointed by the inspection, which was by the inspector general of the Air Force Global Strike Command. Vercher said Folds was telling his officers, in effect, "Quite frankly, you guys should all be embarrassed that in an area that's important, you passed but you were rated as very close to not passing, and that's not acceptable." 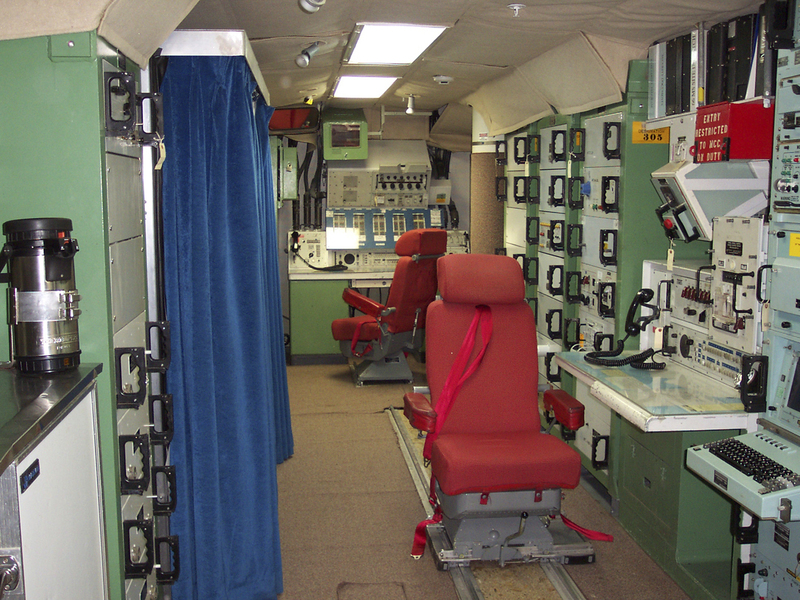 The inspection area to which Vercher referred was proficiency at operating the missile launch simulator and responses to written questions about procedures. Their performance was rated "marginal," which Vercher said is the equivalent of a "D" grade. The inspector's office told the AP that "marginal" is a passing rating, "but attention is needed from leadership to address issues before they become unsatisfactory." "Nobody is comfortable with that," Vercher said. The launch simulator is used in testing for inspection because, for obvious reasons, they can't perform an actual missile launch. Exposure of shortcomings within Vercher's unit recalls an earlier series of stunning mistakes by other elements of the nuclear force, including the August 2007 incident in which an Air Force B-52 bomber flew from Minot to Barksdale Air Force Base, La., without the crew realizing it was armed with six nuclear-tipped cruise missiles. One outcome of the incident was the creation of Global Strike Command in January 2009 as a way of improving management of the nuclear enterprise. Bruce Blair, who served as an Air Force ICBM launch control officer in the 1970s and is now a research scholar at Princeton University, said the Folds email points to a broader problem within the nuclear weapons force. "The nuclear air force is suffering from a deep malaise caused by the declining relevance of their mission since the Cold War's end over 20 years ago," Blair said in an interview. "Minuteman launch crews have long been marginalized and demoralized by the fact that the Air Force's culture and fast-track careers revolve around flying planes, not sitting in underground bunkers baby-sitting nuclear-armed missiles." Blair is co-founder of Global Zero, an international group that advocates the eventual elimination of nuclear weapons.